HP7: Bill & Fleur’s Wedding — Sweetchic Events, Inc. 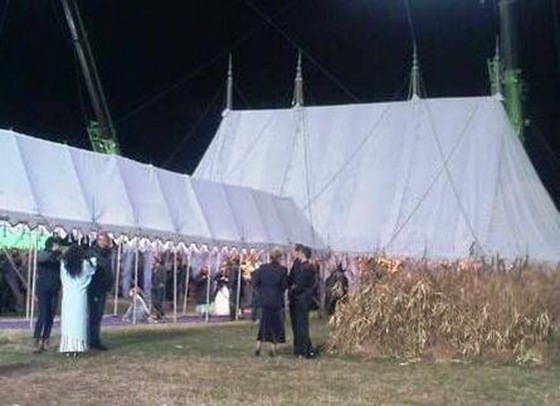 The wedding took place in an enormous tent on the Weasley property. The pathway you see below leading up to the main tent stretched super long towards the main house. My eyes went straight to the black chiavari chairs, which were a nice contrast to the sea of purple. I also liked that the swirls of the gold lantern centerpieces mimicked the swirls on the tent’s fabric panels. I wish I had a better room shot, because the lighting design inside the tent was fabulous and these pictures just don’t do it justice! Apparently there is some controversy over Fleur’s dress, which closely resembles an Alexander McQueen original from his 2008 collection. Fleur’s dress was said to feature two phoenixes, while McQueen’s version featured peacocks… but the similarities are hard to deny, eh? Below is Fleur modeling her dress on the right, and McQueen’s sketch inset on the left. Regardless, the dress is stunning! Did you see HP7 yet? 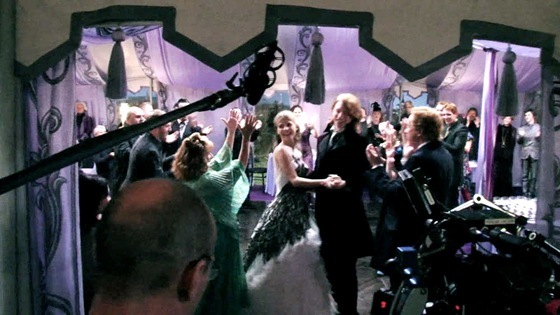 What did you think of Bill and Fleur’s wedding (or the movie in general?) After seeing the movie, I dug out my copy of the book and am re-reading it!